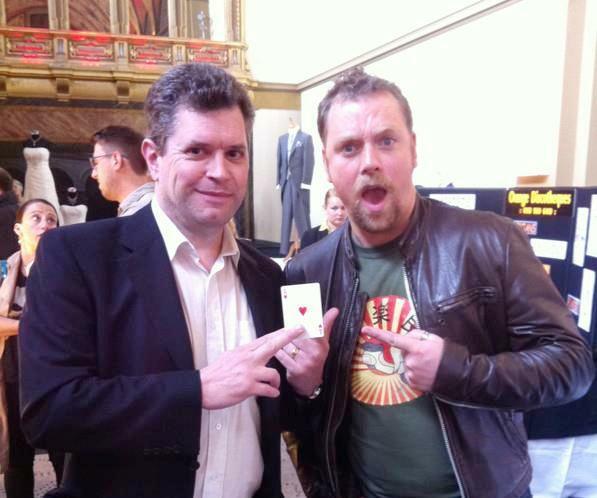 CELEBRITY MAGICIAN - MAGIC for the STARS! Mike is an experienced performer who can guarantee to entertain and amaze your guests - whoever they are! 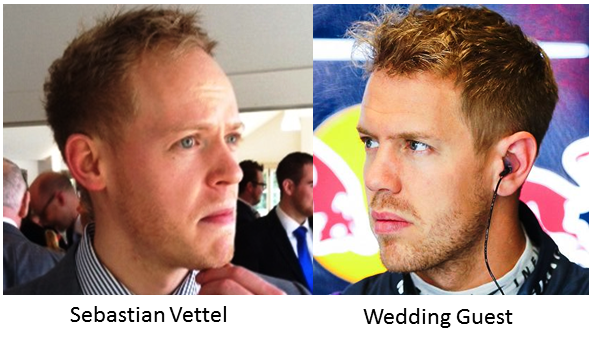 Here are a few of the famous people he has met recently. If you want to treat your guests like stars then book Mike the celebrity magician and guarantee top class entertainment & amazement. 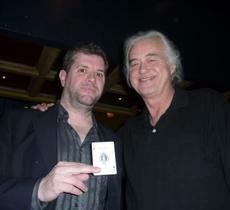 I met Jimmy Page while working in a restaurant. He came in with his family, sat down, ordered some food and none of the staff were any the wiser. 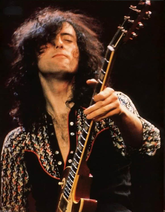 Maybe they were all too young to realise that they were in the presence of the guitarist from legendary rock band LED ZEPPELIN. Someone who has sold well over 200 million albums! 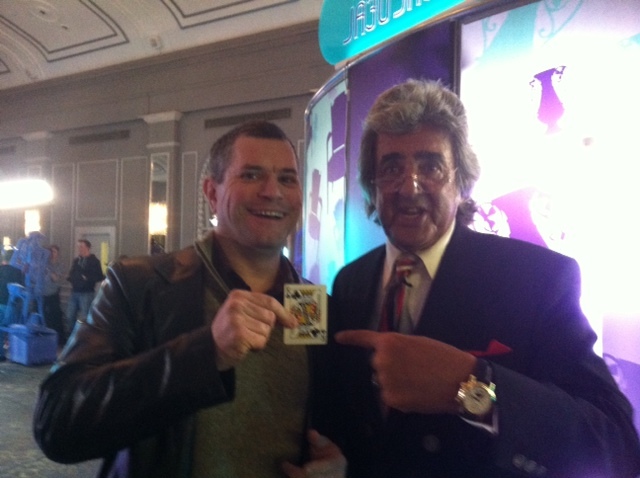 Jimmy really enjoyed the magic and when it came time to get a picture there was only one choice of card to include - the Ace of Spades! 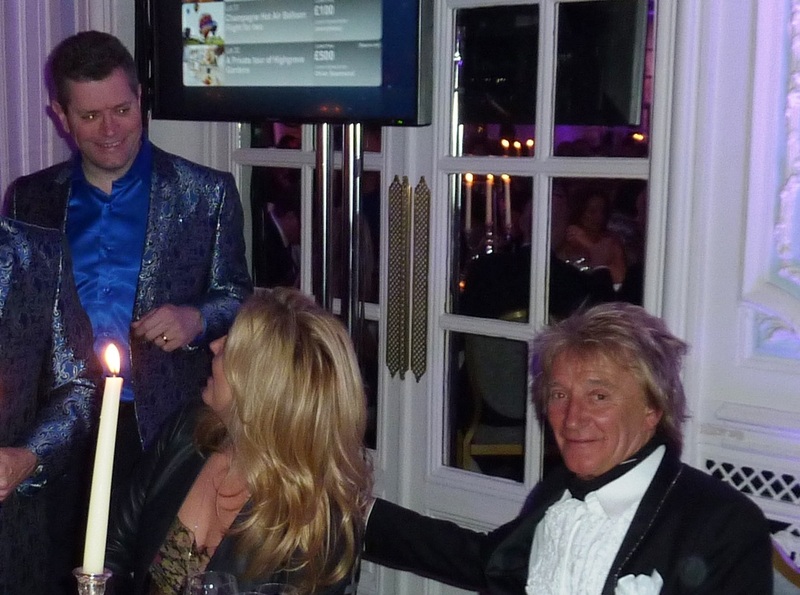 I met Rod and Penny at a charity event being held at The Savoy. It was for one of Prince Harry's charities ("WellChild") and, although the Prince wasn't there in person, he send everyone a video message. Rod and Penny were in great spirits and it was a lot of fun trying to read their minds, even if Rod's thoughts kept turning to his favourite team - Celtic! 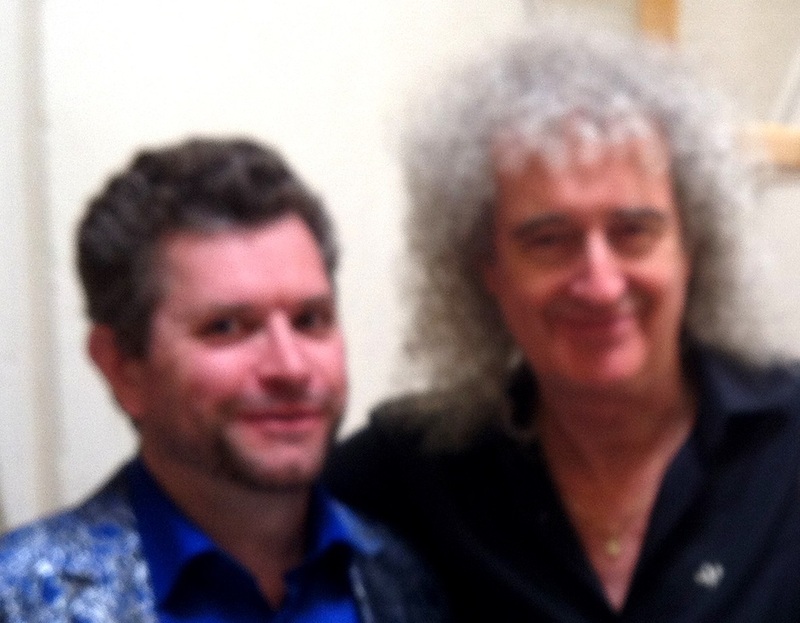 I met Brian, legendary guitarist and, of course, member of the band QUEEN, at the "Wildlife Rocks" charity event in Guildford. I'd been asked to go along and spend a few hours doing mind reading for everyone there. It certainly added something a bit different to the day! A highlight was having a chat with Brian himself. Then he thought of a random word, I concentrated for a few seconds and then said "DESIGN". That was the word! 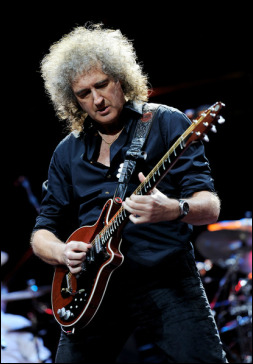 Brian was amazed and said thank you for helping his charity and supporting such a great cause. It was the icing on the cake of a fantastic day of money raising, music and magic! I was invited to entertain at the official opening of the Innovation Indian restaurant in Maidenhead. 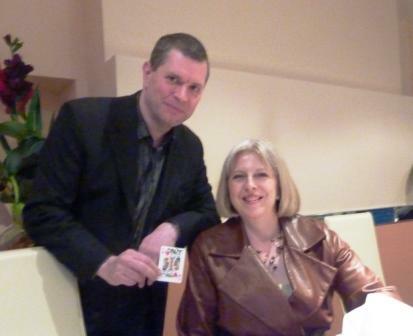 Amongst the guests was the local MP and current Prime Minister Theresa May. She was very interested to see some magic and, when asked to write or draw something on a card, wrote "HAPPY DAYS" across the top. Her job can clearly be very stressful at times, but during the meal she was in high spirits and helped the event go with a swing. 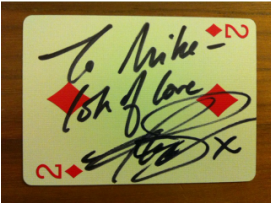 Her card - the King of Hearts. 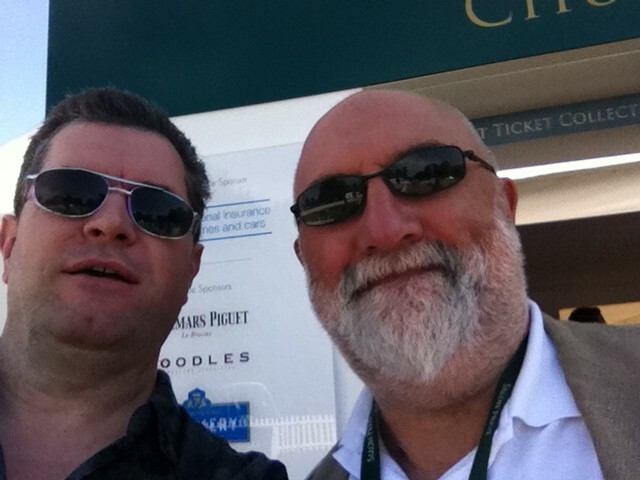 I met Greg at the ATP tennis finals held at the O2. 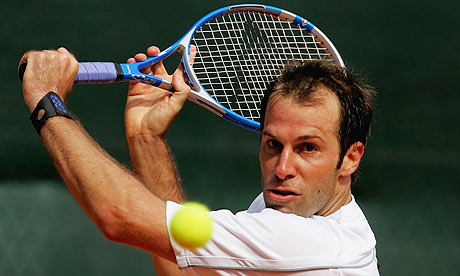 He is still a fine tennis player but on this occasion was part of the commentary team for Sky Sports. In between the matches he had some spare time to see a bit of magic and when it came to choosing his card it just had to be (what else for a tennis star?) an ace - in this case the Ace of Clubs. 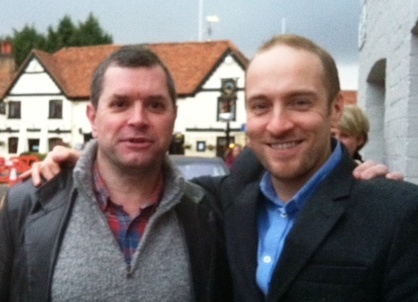 I met Derren at The Fat Duck in Bray - a place that has previously been rated as the best restaurant in the world! It was a huge pleasure to finally meet the man who triggered my interest in the magical arts with his TV shows and live performances. He was a lovely guy and continues to be an inspiration to all of us whose job is to make amazing things happen. You all know David from his TV shows and his knowledge of antiques, but did you also know that he likes a bit of magic now and then? 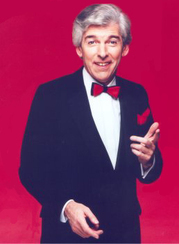 I met him in Windsor during shooting for one of his "Real Deal" TV shows and he was a lovely guy and true gent. 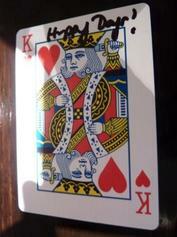 His card is the King of Clubs, although he mentioned that "the knave" might be more appropriate! 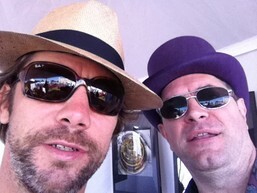 I met Jay Kay at a big society event in London. As well as being the frontman for Jamiroquai he is a well-known car fanatic (owning several rare classics) and famously a lover of wild headgear. 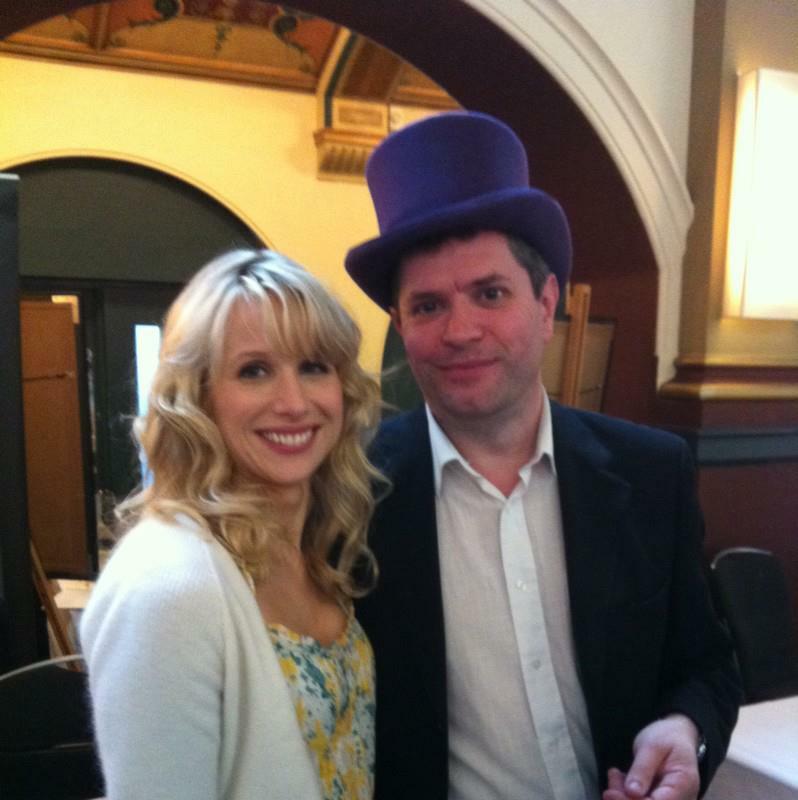 So my purple top hat was a great choice for our meeting! It was a real pleasure to meet Lisa as she is loads of fun (and a bit of a flirt!). 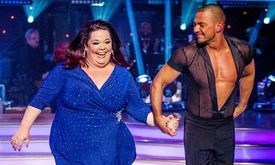 Her humour and spirit is infectious and it's easy to see why she had so much popular support on "Strictly Come Dancing" in 2012. 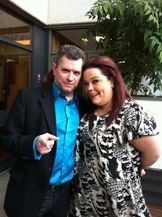 I met her at the ITV studios while doing some filming and it was a definite highlight of the day. She's still loving the dancing and appearing on the SCD live tour - go along and see her if you get the chance. 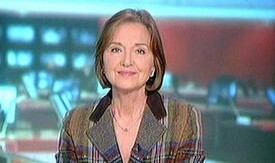 Famous for her newsreading and her dancing skills Angela is a true TV legend. 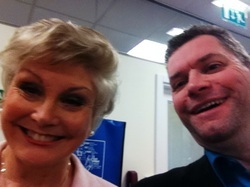 She still works regularly presenting various shows and it was a real pleasure to meet her - she couldn't have been nicer (something which isn't true of all celebs!). I met Anna at a party in Marlow. 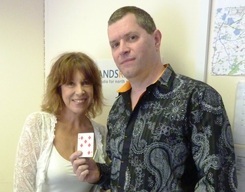 Now in her sixties she still looks amazing and it was a real pleasure to show her some magic. 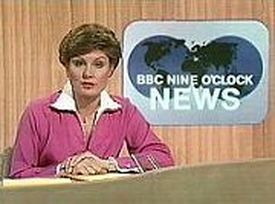 She was also interested in the palm readings that I sometimes do, although in her case it would have been rather easy for me to tell her about her past - "I see a connection to the media and, yes it's becoming clearer now, the news"
Yes, "The Hoff" himself! 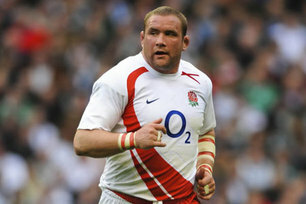 The man - the legend - a world class celebrity if ever I met one! 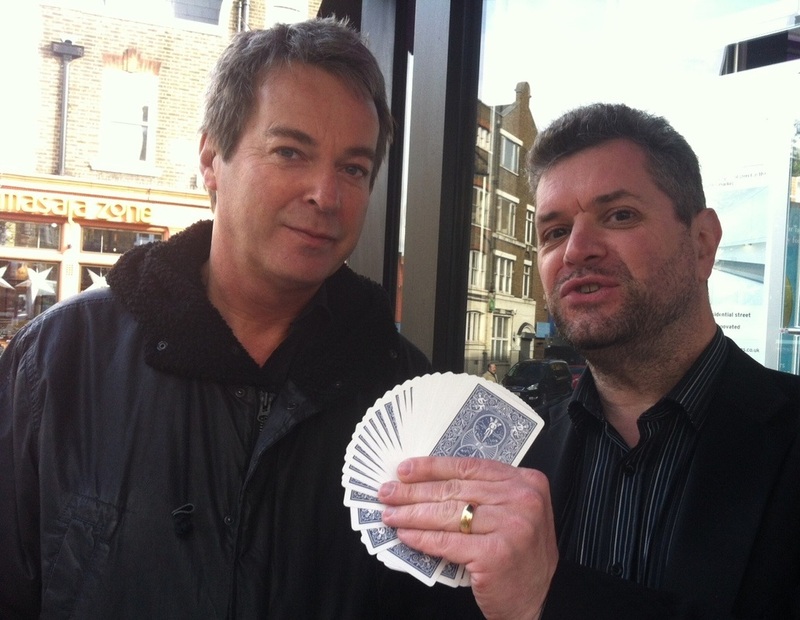 It was a real pleasure to spend some time with him, have a chat and mix it up with a bit of magic. This isn't the greatest picture, I think my cameraman was overcome with excitement at being in the presence of such greatness, but I hope you enjoy it all the same. 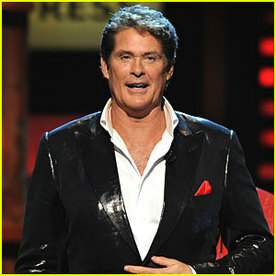 The Hoff's card of choice? Two of Diamonds. I had warmed the audience up with some magic and mind-reading and then Tom delivered a brilliant hour of comedy - he's still got it! And he is one of the few people who can get away with wearing a green suit and make it look good! I met Alexei while out performing in London. 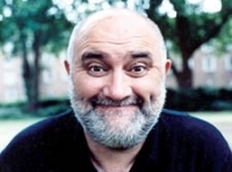 He first came to fame with the "alternative comedy" movement and had many memorable moments on "The Young Ones" TV show. 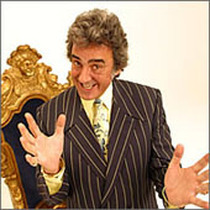 More recently he has acted in films (including Indiana Jones and the Last Crusade), written several books and writes a motoring column for the Daily Telegraph. 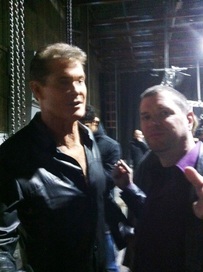 A very talented and nice guy! I met Noel on the way to do magic at The Savoy, a great bonus to the evening! He is a very talented actor, director and screenwriter - and all-round great guy. He is rumoured to be appearing in the next Star Trek film but, at the moment, is probably best known as Mickey from Doctor Who. His card was the five of clubs, by the way. 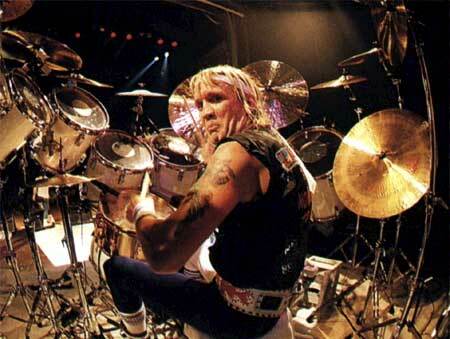 This might not be a familiar name to some people, but for others Nicko is a real legend. He is one of the best rock drummers in the world and has played with Canadian guitarist Pat Travers and French rock band Trust. But of course he is most famous as the drummer for heavy metal maestros IRON MAIDEN. 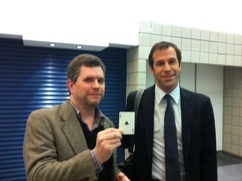 What a great guy and his card - the Two of Spades. 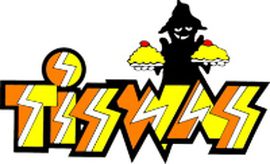 For everyone of a certain age the name TISWAS brings back memories of hilarious chaotic Saturday morning TV starring Chris Tarrant and the lovely Sally James. 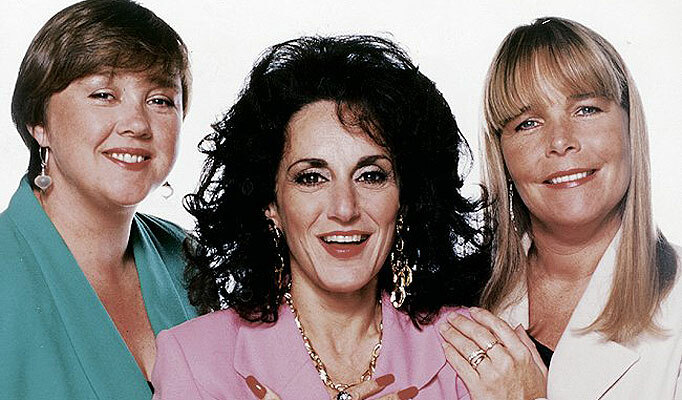 She is now a businesswoman and has a regular show on Brooklands local radio. 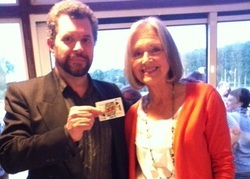 I met her to do an interview about life as a magician for hire in Southern England. You can hear it on their website. Her card - the Seven of Diamonds. 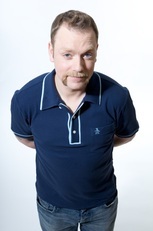 If you've watched TV recently you are bound to have come across comedian Rufus Hound, he seems to be on everything at the moment! 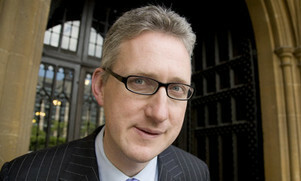 Not only is he a great stand-up and witty quiz show panelist but he is now breaking into cinema and will be starring in a romcom called "The Wedding Video" in 2012. I'm also in a couple of scenes playing a wedding magician - next stop Hollywood! Lucy is an amazing actress whose career just keeps getting better and better. You may have seen her in ITV's "Doc Martin" or in the film "Bad Teacher" alongside Cameron Diaz and Justin Timberlake. She has also worked with Woody Allen and is well on the way to full worldwide celebrity status. Whether playing a femme fatale or girl next door she's someone to keep your eye on. Her card? What else could it be - the Queen of Hearts! 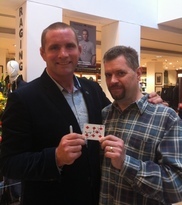 I met rugby legend Phil Vickery as part of the promotion for his new clothing line "Raging Bull". He's a great bloke and really happy to spend time chatting to people. I showed him my "twisted pencil" routine using a pen he had with him - it's a lot of fun if rather bamboozling! 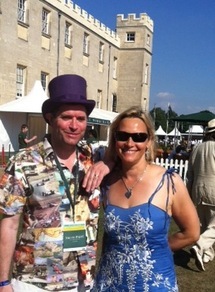 I met TV's "Queen of Speed" while doing magic at "Salon Prive" - the world's most exclusive motor show. Held in the grounds of Syon House it showcases some of the rarest and most amazing (and most expensive!) cars in the world. A Ferrari wouldn't even get a second glance at this place. Entry tickets cost £250! Vicki was judging a car beauty contest and was a delight to meet and chat to, look out for her new TV show coming up later in the year. 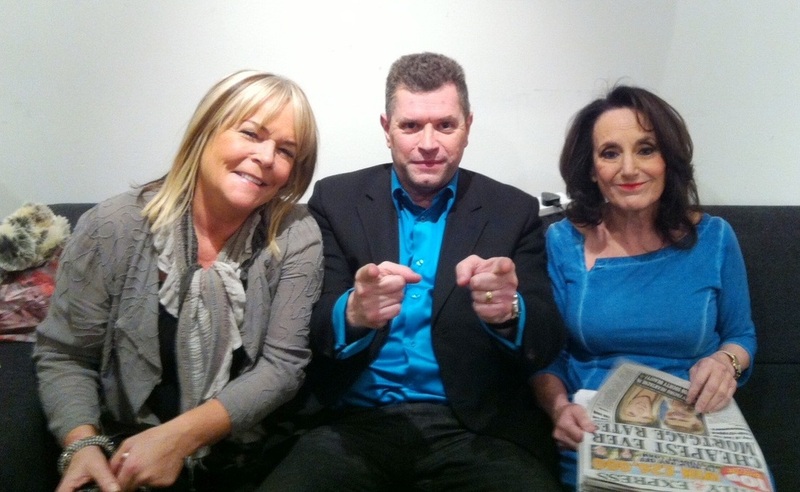 I met Linda and Lesley when we were all doing some filming for the Alan Titchmarsh show. They were happy to see some magic and have a picture taken with me in the middle, which I guess makes me Pauline! I often asked people to sign cards, it helps to personalise the magic and makes sure that I can't do anything sneaky - a signed card is unique in the world! 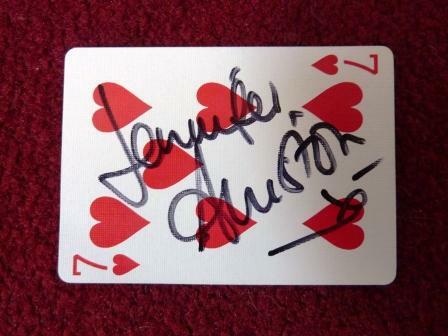 A while back I was performing in a restaurant and at the end of the night noticed that one of the cards was signed "Jennifer Aniston". 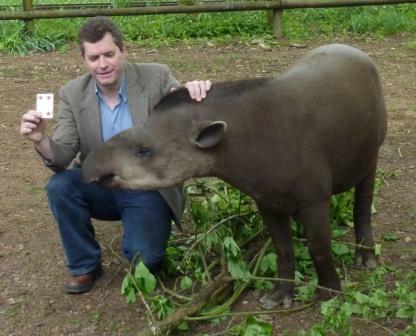 I'm pretty sure I would have remembered doing magic for this world famous celebrity. 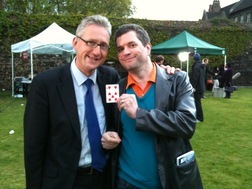 Beside the Seven of Hearts is Lembit Opik's card, so it can't be right, but it's a nice thought.